Hey all! Thought I’d break down a new tune I’ve been working on with Mixcraft 6 called “Intermission”. We’ll assume you’ve already clicked that handsome MP3 player above and are listening. I’m going to go through its individual parts in the next couple of blog entries, and you can download the entire Mixcraft 6 file below to see exactly how I constructed it. Be aware some plugs may be disabled depending upon which Mixcraft version you’re using ( I used the top-of-the-line Mixcraft Pro Studio 6 edition because I’m special). – click the “Library” tab at the bottom left in Mixcraft. You can preview loops (or sound effects) by clicking the green triangle. To narrow down the selections displayed, click the “Library” and “Sort By” pop-up menus. You can also enter search terms in the “Search” box. If you want to find the beat I used, you could type something like “Beat 1 Dj Puzzle”. – to add a loop to the Track View window, you can either click the blue plus sign in the library window, or drag and drop a loop to the appropriate track in the Track View window. If you drag and drop, just remember that these loops and sound effects are audio, so they must be dragged to an audio track (audio tracks have a speaker icon). – one nifty aspect of loops is that it’s easy to manipulate their length by simply grabbing the left or right edge and moving them, thereby “closing up” the window of sound that plays. This is handy if you only like part of a drum beat within a loop, for example (I recommend setting the “Snap” pop-up at the top of the window to a musically relevant value to ensure that the loop start and end points end up on bar or beat lines). Though Mixcraft makes creating music with loops material super easy, in this case I just used the drum loop as a temporary backdrop. Why not just use the loop for the “real” beat? Loops sound great, but they’re not always ideal for a “traditional” drums/bass/guitar-style rock song, for a couple of reasons. Drum fills and rolls aren’t that easy to create with a fixed loop (though some collections include variations including fills). And if you like mixing drums as you would a traditional multi-miked drum kit, you’re out of luck because all the components are typically combined into one stereo audio file. 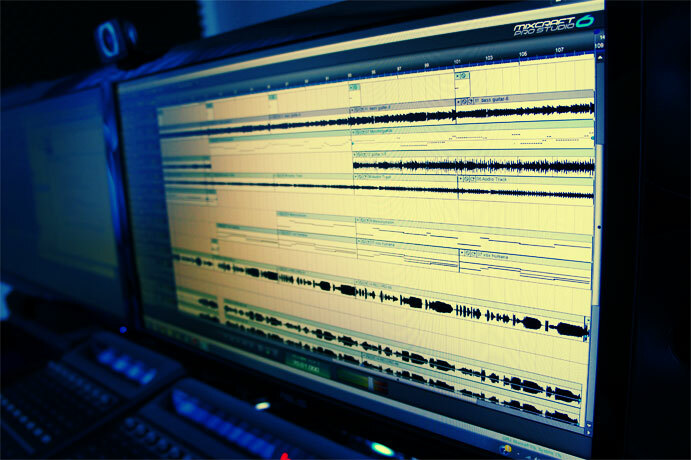 Using programmed single-hit MIDIed drums samples, we can split the individual instruments across separate audio channels. This offers tremendous flexibility to compress, EQ and reverb individual instruments, just like a real, live drum kit (the best example is that you frequently want a huge reverb on snare drums, but that same reverb usually sounds awful on a kick drum). BTW, if you downloaded my Mixcraft song file, you’ll notice I left the “Beat 1″ drum loop in the final song with the mute button on – just click the mute button to hear it. – Create a new virtual instrument track from the Track menu by clicking Track>Insert Track>Virtual Instrument Track, then click the keyboard icon on the track. 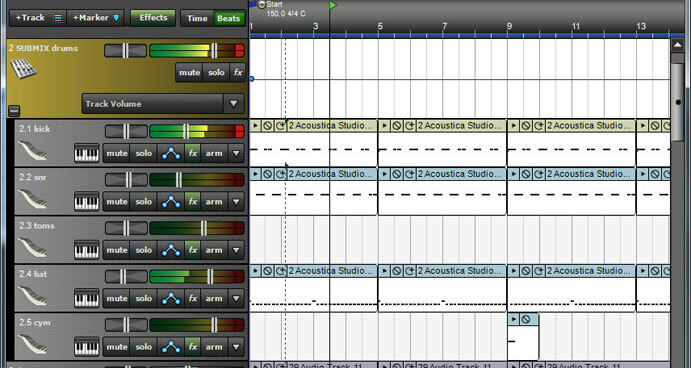 Select “VSTi Instruments”, then “Acoustica Studio Drums”. Now click the red X in the upper-right corner to close the instrument selection window. – Make four duplicates of the Acoustica Studio Drums track by clicking on the track, then selecting Track>Duplicate Track from the top menu (alternatively you can insert, delete, or duplicate tracks by right-clicking). 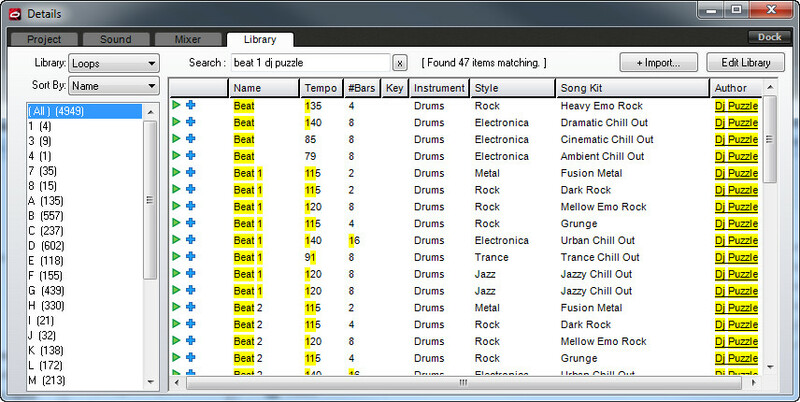 – Rename the five drum tracks by simply double-clicking on their names. Name them “kick”, “snare”, “tom”, “hats”, and “cymbals” (or “Bob” and “Larry” and “Xavier” if you really want). – At the top of the window, select Track>Insert Track>SubMix Track. If the new submix track isn’t already there, grab it and move it above the kick drum track. This won’t affect how it works, but it’s a good idea to keep things visually organized. – Rename the submix track by double-clicking on the name – something like “Drum Submix” would be good. – This part’s important- we’re gonna reroute the drum channel audio outputs to the drum submix channel fader. Click the “Mixer” tab at the bottom left. Make sure the drum channels are visible in the mixer- you’ll see the track names at the bottom of the mixer window. 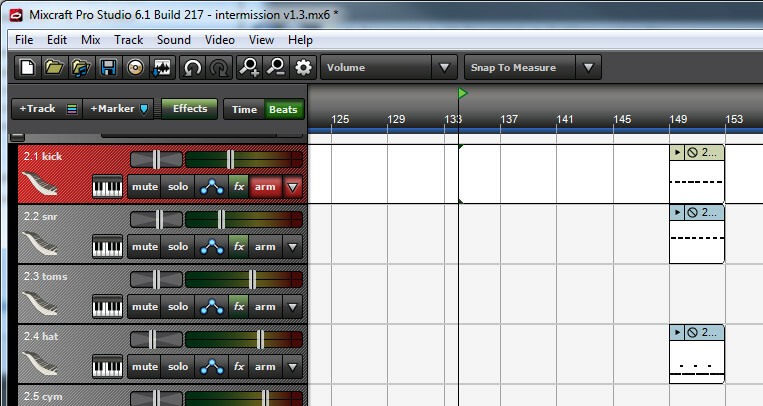 If you don’t see the drum channels, grab the scroll bar beneath the mixer and slide horizontally ’til they’re visible. Now click at the top of the kick drum channel, just beneath “Output”, and select the “Drum Submix” send channel. Repeat this for each drum channel. – Select the kick drum track by clicking on it. – Click to enable loop recording by clicking the loop button in the transport. Set the loop start and end points at the top of the track view window by dragging them- I recommend a two- or four-bar length. Make sure the snap drop-down menu at the top of the window is set to “Snap To Measure”, otherwise you’ll end up with funky loop points (and by “funky”, I don’t mean in the good, everybody-dancin’ way). 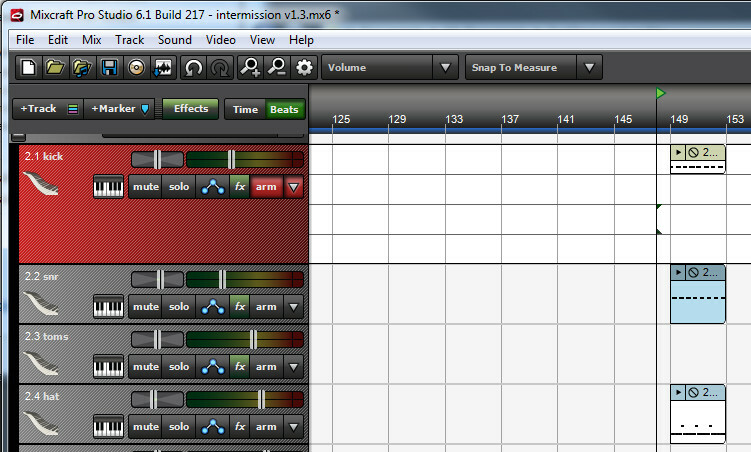 – Turn on the recording metronome (this may already be on) by clicking the metronome icon. 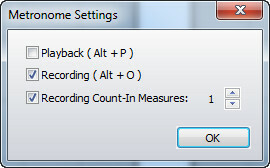 Set it as above for click during recording only and a one-bar (i.e. four click) countdown before recording begins. Now repeat the process to quantize the snare and hat clips and we can all dance like Asimo The Robot. You can create more patterns by repeating the above steps, or make copies of existing ones by highlighting clips and option-dragging (remember to be aware of Snap menu settings). Once I have basic patterns sorted out, I’ll go back and add cymbal crashes, and snare and toms fills using a mix of “live” recording (i.e. playing the keyboard) and drawing in notes using the pencil tool in the piano roll window. For maximum realism, I like to determine where a real drummer’s high hats would drop out during fills and edit the appropriate notes out. In our next installment, we’ll talk about how to add compression, EQ and reverb for monster-sounding drum tracks! It looks like this is going to be one of my favourite blogs. I have a lot of learning to do. Many thanks. Let’s just say Mackie control support may be coming to Mixcraft soon… and thanks for the complement on my tune! This is good stuff. I wasn’t aware of the submix option. I anticipate using it a lot now that I know about it. One question about MIDI drum tracks–I like to play in the whole kit at once and then tinker with it. Is there an easy way to separate the MIDI data afterward? So if all MIDI data for the kit is on one track, is there an easy way to pull separate elements out, like the snare, and drag/paste to a new track? Good question.Though I played each drum part separately in the blog entry using lanes for the blog entry, I frequently want to play more than one drum in a pass. Mixcraft doesn’t have a specific command that will split them out after the fact, but I usually just duplicate the entire clip for each drum then delete the unwanted notes in the MIDI piano roll editor window. In the MIDI editor, if you double-click on the piano keyboard to the left of the note data, all the notes for the key you selected will be selected. If you hold down the Shift key and double click another note, it will select all those notes, too. Then you can hit the delete key to delete the selected notes. This does help…thanks! I didn’t know the piano keyboard worked liked that. It’s so much faster than what I was doing before. It’s great that the acoustica team is always there for its people! Nice tutorials and tips. I’m looking forward to read some more. Keep them coming! I have a question about effects sends. I like the fact that I can sub out my drums so that I can mix the drums and I’m then able to control the entire drum kit as a group with a single fader. My problem is that I’d like to be able to have effect sends on each of the child tracks so I can send varying amounts of signal to an effect, such as a reverb. That way I could send snare and toms to the reverb without sending kick or cymbals. I don’t want to use multiple copies of the same plugin on each channel. That’s redundant and cpu intensive. I’d like to be able to send signal to one copy of the plugin on a send channel. Unless I’m missing something this isn’t possible in Mixcraft 6 right now, is it? If not, isn’t that a basic function that should be available on each of the child tracks in a subgroup? Is this something that will be rectified in future versions of Mixcraft? I may have spoken too quickly on the submix effects availability. Seems like that’s mostly answered in part 2 of this article. I’ll have to study it better to wrap my head around the process. Hey Mark… using a send track to submix a group of channels (i.e. a drum kit) is very similar to using a send track for sending different drums (on different channels) to one common effect. The main difference is that when you’re submixing a drum kit to one fader with send track, you set the output (at the top of each mixer channel) to send the entire signal to the send track for each track (i.e. removing them from the main L/R bus). This sends the entire dry signal to the send channel fader, effectively making it a “master volume” control for all channels routed to it. Conversely, if you’re using a send track for a bus effect (e.g. sending varying amounts of each channel to a single reverb), you could leave the individual channel outputs set to Main Mix so that the dry signal remains in the main L/R bus. You would then use the red Send knob to set how much signal would get routed to the reverb send channel (if you have more than one send channel set up, make sure to check that you’re setting the red send knob for the correct send channel by clicking on the channel in the mixer and looking at the Send Channel pop-up menu at the top left of the mixer). With all that clear, the answer to your question is “no”, sort of Let’s say we made a send channel and routed all the drum channels to it. Then we make another send channel for a single reverb and set the send knobs to different levels for each drum. If we adjust the send channel “master volume” of the drums, it’s only going to affect the overall volume of the dry drum kit – the reverb send channel level will remain the same. This is because the channel sends operate independently of the send channel we’re using for the dry mix. In other words, you’d need to adjust both the dry mix and the reverb send channels to maintain the relationship of dry and reverb volume. That said, in reality this may not be much of an issue. This could vary depending on what you’re trying to do, but for me, the idea of having all my drums mixed to a single submix isn’t usually because I’m actively varying the volume of the entire drum kit within a finished mix. It has more to do with the convenience of being able to mute the entire kit while tweaking something else, or giving a quick permanent adjustment (i.e. “hey, the drums need to be louder”), so adjusting both the dry and effects faders isn’t typically too big a deal. Hope this helps! Thanks for the speedy reply. I guess I need to be more specific with my situation. The problem lies in using a VSTi drumkit and not live drums for drums in the mix. Specifically, I’m using Toontracks EZdrummer. EZdrummer has it’s own 8 channel mixer that I have the ability to send to Mixcraft as an EZdrummer channel with 8 seperate child tracks. The problem is that there is no way to add an effects send to one of the child tracks on a VSTi within Mixcraft as far as I can tell. There is also no way to do it in EZdrummers mixer. I know I can use multiple instances (channel inserts) of a plugin (reverb for instance) on each of the individual child tracks, but was trying to avoid that when I really should be able to send signal to an effects send for the different drums. I guess I could also pull out each of the instruments from the midi performance and render/convert them to audio tracks, create a sub mix of the audio tracks, and then have the ability to have an individual channel send to the effects channel, but I want to be able to maintain flexibility in performance and sound. Is there any other simple way to do this in Mixcraft? … should explain using the separate outs, and once you have the individual tracks set up in Mixcraft, you should be able to create a send track, insert a reverb on that, use the red send knob in the mixer to send varying amounts of each drum to a single reverb, and Bob’s your uncle. Please let me know if I’m overlooking something and this doesn’t work out for you (we may have to turn you over to the hardened tech support men of Acoustica!). Any of the other solutions you suggested are all viable options, but add more steps and/or make editing more difficult. There isn’t really a “right” way; it kind of comes down to how you like to work. Personally (and I may be in the minority), I don’t like using drum virtual instruments that force you to use an onboard mixer, because you end up with what I call “plugging a mixer into a mixer”. I REALLY want all of the faders for all elements of a song to live in one mixer. My workaround is usually to program beats with one instance of the drum instrument, then duplicate a bunch of them when I’m done and make each MIDI clip an individual instrument. Then I can use one instrument per channel for easy processing. I know it’s a kind of neanderthal solution but the reality is that just about any modern computer has plenty of processor power, so other than the guilt of knowing your being excessive, it probably isn’t causing any real problems, and it completely eliminates potential mixer-to-mixer routing or channel assignment issues. I should be able to do all that…. but I can’t. The child tracks created under the EZDrummer VSTi have no red send knobs. As far as I can see it’s not an option. I’m not sure why, but that’s the way it is and I have to use one of the more complicated work arounds. I hope Acoustica knows this limitation and it’s something that’s addressed in later versions. “Intermission” is nice but it sounds a lot like Q Lazzarus “Goodbye Horses”. The info on drum tracks is priceless though. Thanks! Can safely say I wasn’t influenced by it as I’m not familiar with them, but I openly admit to listening to a whole lot of Joy Division and Interpol (at least the first two records…). No better place than being immersed in the beautiful women found in Las Vegas strip clubs!